Spring is hitting the northwest, almost in time for summer. We broke Seattle’s rainfall record for April, But now it’s oh-so-beautiful, as the trees start daring to come out. Before that time of the year begins when many of us will be drawn to be outside, why not do a little reading? Here are a few suggestions, from the blog and my bookshelf. In Ten Leadership Lessons to Steal from Springsteen, I offered some insights from the Boss and encouraged you to read his memoir. Turns out his lyricism extends way beyond his songs. In Finding an Anchor in Changing Seas. I looked for anchors that can ground us when the waves get choppy, including some simple practices to use in these unsettling times. In A Manifesto for Disruptors and Trouble-Makers, I created a manifesto and invited you to do the same. Claiming your own voice through a manifesto is powerful and energizing. In Why Some Meetings Fail Before They Begin, I talked about the kind of facilitation that needs to happen before a meeting even starts. Here’s to meetings that have a chance of working! And in Finding the Essential in Aerospace and Art, I shared about my recent trip to Jeff Bezos’ super cool Blue Origin company, and linked that to design, and through that, to art. This timely book became a lot more timely after the elections, offering me a peak into a culture, and part of the country, which I knew little about. There’s so much to appreciate here: first, the book’s written as a memoir. Despite the fascinating socio-cultural information provided, the book is one man’s story, as we follow the arc of an incredible journey from the hills of Kentucky to Harvard Law and beyond; second, although the author travels about as far from hillbilly culture as it’s possible to go in our world, he still sees himself as belonging to the hillbilly culture he grew up in; third, the book avoids the right/wrong dichotomies that are racking our country. 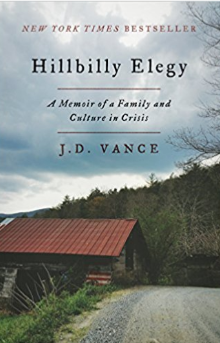 Vance is intensely critical of how hillbilly life fails its members, yet he loves that culture deeply. His cranky grandmother might have blown your head off if you approached her door, yet she was his anchor and passport to an education that provided him with options most of his friends would never have. 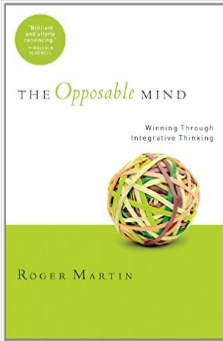 Opposable Mind by Roger Martin. I’m a big fan of polarity thinking—the idea that we can hold in creative tension ideas that seem to be opposing but are actually interconnected, such as the value of individual rights and that of honoring the collective good. Martin believes this capacity to hold opposing ideas creatively, which he calls integrative thinking, is characteristic of great leaders. One main idea: don’t copy what leaders do—notice how they think. Some of you might not be drawn to a book with God in the title (used lightly without dogma), or about women (implying not for men), or focused on food (but no menus included). This book is jaw-droppingly good. Her premise is, “The way you eat is inseparable from your core beliefs about being alive.” Wow. She nails it, and she should after years of helping herself and others end their compulsive craziness around food. In a culture obsessed with thin, the delusion that “if only I were thinner” slips in as a mantra keeping many women from a deeper relationship with themselves. And because we all need to eat, someone with a food issue will this challenging part of life everyday. 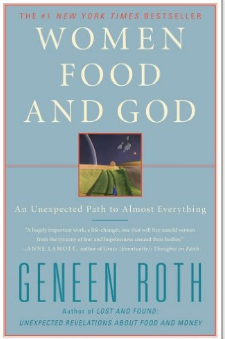 Ultimately, though, this book is about more than food habits. She speaks to something deeper that may be true for most of us: in a world where we often feel out of control, we want to find something we can control—whether it’s through controlling others, controlling our relationship to food, or other compulsions. We invent many escape routes that distract us from the hard work of acknowledging and facing the pains and burdens we carry from the past. The book left me thinking, not only about my relationship with food, which, thankfully, has gotten saner as I age, but about the crazy and often self-deprecating messages I make up to avoid ever having to address what has not yet healed within me. 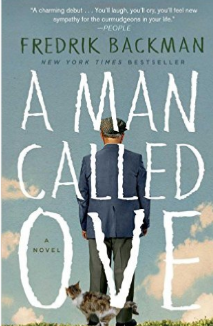 A Man Called Ove by Frederick Backman. The secret’s out on this book, especially with the movie making the rounds, but what a lovely read it was—about an irascible, but ultimately lovable Swede and his sour tempered adventures. The book’s quirky redemptive note at the end reminds us, without preaching, not to judge others by what we see on the surface. If you want a lighter read in an era of dark politics, this is quite enjoyable. And now to you: what are you reading these days?